Hey we all have those times when you can’t get in for a massage or bodywork session. and there are many reasons why: maybe someone like me is booked up for the time you need, maybe you are so busy that you can’t squeeze an hour in for yourself anywhere. But you still need to take care of yourself so you can take care of what’s important to you, right? So here are some simple routines you can do at home or while travelling. Your body and mind will thank you and your muscles may not be as solidly tense the next time you get a massage. Epsom salt bath / or go to a spa – the healing benefits of hydrotherapy (water therapy) have been used for ages and can be as simple as an Epsom salt bath at home, or as luxurious as a visit to a spa. Either way, your tight muscles will melt, and your mind will follow. In an ideal world I would live in the shower or my tub and have all my meals brought to me (not unlike Cosmo Kramer in that one Seinfeld episode). Perfect for after a hike or other workout, or for preparing for bed when you are stressed and/or in pain. Gentle yoga class – I love to go to a gentle yoga class at Whole Life Yoga and then follow it up with an Epsom salt bath or visit to my local women’s spa, Ladywell’s. This combo is the closest thing I’ve found to how I feel after an awesome massage! Sit with hot and / or cold pack – No time to run a bath or visit a spa? Sit for 10-20min with a heating pad on areas of soreness and your muscles will get a much-needed break from tension and pain. If your muscles are very tender to the touch, opt for an ice or cold pack instead, as there may be inflammation present. Hydrate well – Speaking of water, remember to stay well-hydrated, our bodies are made up of something like 70-80% water, and it relies on hydration to keep it functioning at its best. Tight muscles can be a sign of dehydration, so drink up, and it may make that tension headache a thing of the past. Meditation – Even a five minute meditation can make a difference in how you feel, but I prefer to meditate for at least ten minutes or more. It helps me feel relaxed, more focused, productive, and calm. I also get ideas for blog posts and my art. Insight Timer is my favorite app for a steady stream of guided meditations, as well as a way to track my meditation practice over time. Go for a walk – I love to go for walks daily, and I just feel “off” when I don’t. If meditation isn’t your thing, walking slowly and taking your time while bringing your attention to your breath and your environment, has many of the same benefits as seated meditation. 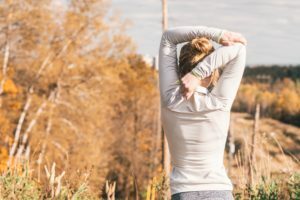 Breathwork – Chances are, you already know about the benefits of deep relaxed breathing, but when was the last time you really practiced it on a regular basis? Go on, take ten deep relaxing breaths into your belly and chest now, I’ll wait… Really lengthen each one and make this practice all you think about for the next minute or two. Your body awareness will increase, maybe even your posture (try slouching and taking a deep breath, it doesn’t really work! ), and your mental alertness will increase with more oxygen to your brain. Breathing like this also increases digestion, giving your internal organs a mini-massage in the process, and improves lymph flow (lymph fluid circulation helps your immune system function at its best). Foam rolling – Love it or hate it, foam rolling can make you feel like you have a brand new back and pair of legs, and if your foam roller is busy gathering dust, brush it off and try it again for just five minutes, giving yourself frequent breaks. Do this daily for a week, and you will be able to increase the time you use it. Roll slowly over it until your come to a tender or tight spot and breathe deeply. Holding your breath on tight spots will actually increase the tension in your body, which isn’t what you want! When a spot becomes less intense, move on. There are also softer foam rollers on the market which still get the job done, if your current version is too firm for your liking. Self-massage with a tennis ball or other massage tool – Similar to foam rolling, massaging your back with a tennis ball or Theracane or other massage tool works wonders when you’ve been working at your computer too long or slept in a weird position. I like to put a tennis ball in a pillow case, sling it over my shoulder and sit back against a wall to apply the right pressure to my tight spots between my shoulder blades as well as those postural muscles along each side of my spine. I have a hook/cane shaped tool called a BodyBackBuddy (similar to a Theracane) which helps me get those hard-to-reach spots in my back with minimal effort. They cost a fraction of the price of a massage, and are so worth it!